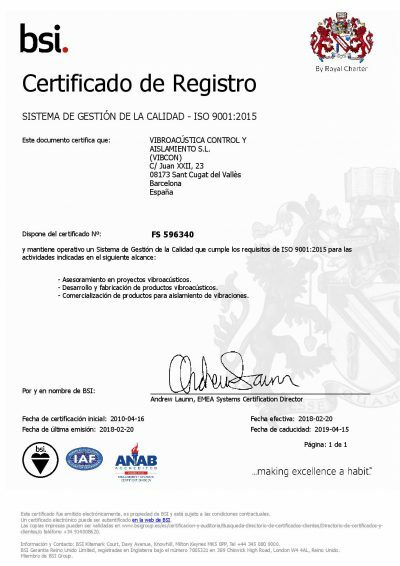 Vibcon is certified with ISO 9001: 2015 for the following activities: Vibroacustic projects assessments. Developement and manufacturing of vibroacustic products. Commercialization of products for vibration isolation. Technology center integrated in the Mechanical Engineering Department of the Polytechnic University of Catalonia. It brings together experts in acoustics and vibrations that provide services and advice in different areas in acoustics. BES La Salle, Masters Center in Engineering and Architecture. MAAM – Master in architectural and environmental acoustics. Association of Companies of acoustics sector in a national level.